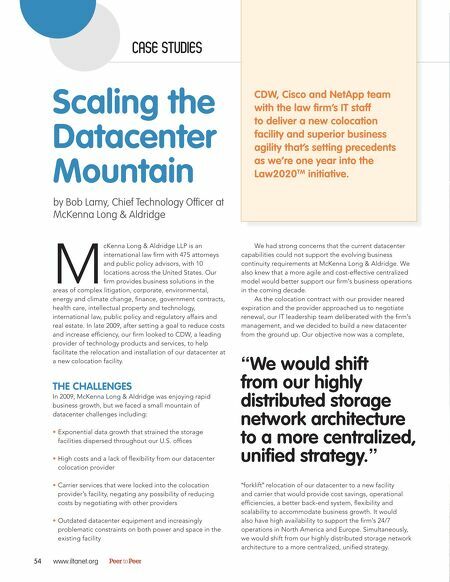 CASE STUDIES Scaling the Datacenter Mountain by Bob Lamy, Chief Technology Officer at McKenna Long & Aldridge M cKenna Long & Aldridge LLP is an international law firm with 475 attorneys and public policy advisors, with 10 locations across the United States. Our firm provides business solutions in the areas of complex litigation, corporate, environmental, energy and climate change, finance, government contracts, health care, intellectual property and technology, international law, public policy and regulatory affairs and real estate. In late 2009, after setting a goal to reduce costs and increase efficiency, our firm looked to CDW, a leading provider of technology products and services, to help facilitate the relocation and installation of our datacenter at a new colocation facility. THE CHALLENGES In 2009, McKenna Long & Aldridge was enjoying rapid business growth, but we faced a small mountain of datacenter challenges including: • Exponential data growth that strained the storage facilities dispersed throughout our U.S. offices • High costs and a lack of flexibility from our datacenter colocation provider • Carrier services that were locked into the colocation provider’s facility, negating any possibility of reducing costs by negotiating with other providers • Outdated datacenter equipment and increasingly problematic constraints on both power and space in the existing facility 54 www.iltanet.org Peer to Peer We had strong concerns that the current datacenter capabilities could not support the evolving business continuity requirements at McKenna Long & Aldridge. We also knew that a more agile and cost-effective centralized model would better support our firm’s business operations in the coming decade. As the colocation contract with our provider neared expiration and the provider approached us to negotiate renewal, our IT leadership team deliberated with the firm’s management, and we decided to build a new datacenter from the ground up. Our objective now was a complete, “We would shift from our highly distributed storage network architecture to a more centralized, unified strategy.” “forklift” relocation of our datacenter to a new facility and carrier that would provide cost savings, operational efficiencies, a better back-end system, flexibility and scalability to accommodate business growth. It would also have high availability to support the firm’s 24/7 operations in North America and Europe. Simultaneously, we would shift from our highly distributed storage network architecture to a more centralized, unified strategy. CDW, Cisco and NetApp team with the law firm’s IT staff to deliver a new colocation facility and superior business agility that’s setting precedents as we’re one year into the Law2020TM initiative.